When we returned from Italy I had a list of three dishes I wanted to learn to make. The first was Aubergine Parmigiana. Our hotel served a to-die-for version for lunch and I’ve been trying and failing for several weeks to recreate it. The second was a dish I ate in the fantastic Leon di Oro in Riva: Tagliatelli with Black Truffles and Vezzana Cheese. I kid you not, the restaurant version is perhaps the nicest thing I’ve ever eaten. Ever. Looking forward to making that once truffles come into season later this year. And the third was Taglierini al Limone, a delicate, fresh pasta dish that I ate in a little trattoria in the lovely town of Arco. It’s been very simple to recreate and, being so light and so simple to make, it has been my post-run lunch of choice this summer. Sigh. I miss my lazy summer lunches. Whisk together the lemon juice and oil until emulsified. Bash the garlic clove with a rolling pin and pop it in the liquid to infuse. Bring a large pot of salted water to the boil and cook the pasta. Drain reserving a little of the cooking water. Immediately after draining, add the pasta back to the pot. Remove the garlic from the lemony oil (you just want a hit) and add the oil and cheese to the pan. 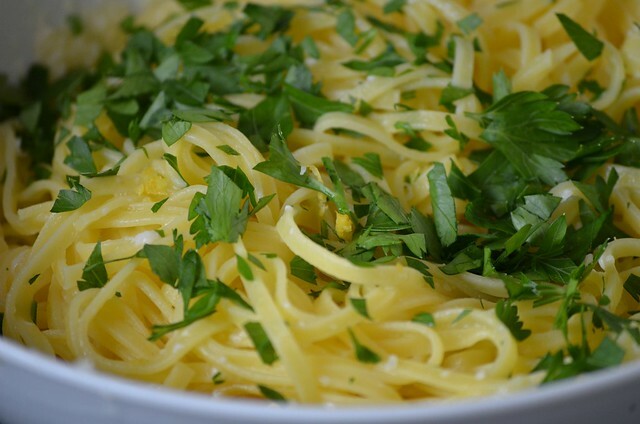 Use two forks to lift and toss the pasta, working the cheese and lemony oil evenly through it. Serve scattered with a grinding of pepper and a scattering of parsley.